Directed by Terence Malick and starring Brad Pitt, Jessica Chastain, and Sean Penn, this film is a grand and audacious piece of cinema that intertwines images of the creation of the world with the life of a young boy in 1950s Texas. When I say daring, I mean that you will either find it fascinating or very, very dull. There does not seem to be much middle ground here. The film begins with a biblical allusion to Job and depicts a flickering golden light. Over these images are whispered words urging the listener to follow either grace or nature in life. Then, both Mr. and Mrs. O’Brien (Jessica Chastain and Brad Pitt) find out separately that one of the sons has died, and the reason is not explained. In the present, one of their sons (Sean Penn) who is now an architect contemplates his life while trying to get through his day. Then, we witness the breathtaking formation of creation, with the creation of the planets, sea, and life itself. Back in 1950s Waco Texas, a young couple has had their first baby boy, and then two more follow in the ensuing years. Most of their life is focused on the conflict inside of the young boys, Jack. He must struggle with a mother who is gentle and loving, and a father who is authoritarian and even abusive. After one friend dies and another is burned, Jack begins to grow more disillusioned with the world and his parents. During a summer, their father goes away and during that same time, Jack becomes even more rebellious. Then their father is in trouble of losing his job, and he questions how he has lived his life to deserve such a fate. Back in the present, Jack has a fantastical vision seeing his younger self, as well as his family and others walking on the beach and the film, ends soon after. The closest movie that I can think of with the same thought-provoking intentions as The Tree of Life is probably 2001: A Space Odyssey. 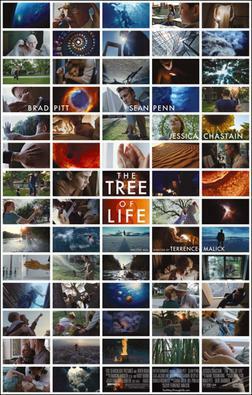 However, I think I surprisingly appreciated Tree of Life a little more, because it focused more on the human aspect instead of the fact that humans are insignificant and primitive in the realm of outer space. Furthermore, the ending of this film somehow seemed reminiscent of La Dolce Vita, since both had rather cryptic conclusions taking place on expansive beaches. This entry was posted in 2010s, Coming of Age, Drama, Spiritual and tagged Brad Pitt, Emmanuel Lubezki, Jessica Chastain, Review, Sean Penn, Terrence Malick by 4StarFilmFan. Bookmark the permalink.